The Navy League of the United States New Mexico Council (NM Council), as one of its core functions, offers a college scholarship program for all the U.S. Sea Services; the Navy, Marine Corps, Coast Guard and U.S. flag Merchant Marine Active or Reserve Members and their eligible dependents. Deadline for Applications: December 1, 2018 ($750.00) award. 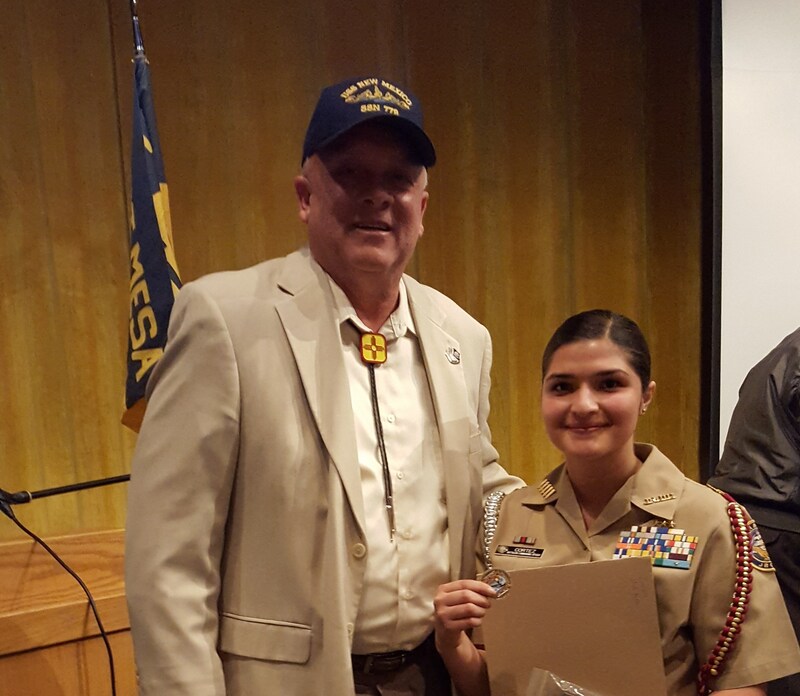 Cadet Lieutenant Commander Roxanne Cortez is the West Mesa HS NJROTC Unit's Outstanding Cadet for 2017. Cadet Cortez received the U.S. Navy League's Theodore Roosevelt award for her outstanding performance during this past school year. West Mesa NJROTC has been Commanded by Major Mark Hendricks, USMC (Ret.) for the past 19 years. Cadet Cortez is also shown holding a Commissioning Coin from the USS NEW MEXICO (SSN-779), presented to her on behalf of the submarine's Commanding Officer, Commander Dan Reiss, USN. PORTSMOUTH - The nuclear-powered attack submarine USS New Mexico (SSN 779) and her crew of 15 officers and 117 enlisted personnel arrived at Portsmouth Naval Shipyard Thursday morning. While at the shipyard, New Mexico will complete scheduled maintenance work and several system upgrades. Portsmouth Naval Shipyard is the Navy's center of excellence for submarine overhaul, repair and modernization. New Mexico is the sixth Virginia-class submarine, and the second naval vessel to be named in honor of the state. During Ice Exercise 2014, New Mexico made history as the first Virginia-class submarine to surface at the North Pole. Attack submarines like New Mexico are multi-mission platforms enabling five of the six Navy maritime strategy core-capabilities - sea control, power projection, forward presence, maritime security and deterrence. The submarine is designed to excel in anti-submarine warfare, anti-ship warfare, strike warfare, special operations, intelligence, surveillance and reconnaissance, irregular warfare and mine warfare - from open ocean anti-submarine warfare to intelligence, surveillance and reconnaissance, to projecting power ashore with special operation forces and cruise missiles in the prevention or preparation of regional crises. New Mexico returned from her latest deployment to the U.S. European Command area of responsibility April 26, where it executed the Chief of Naval Operations? maritime strategy in supporting national security interests and maritime security operations. 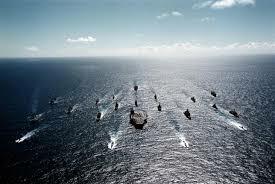 During the deployment, New Mexico steamed approximately 31,000 nautical miles. New Mexico's crew also supported diplomatic relationships by conducting port visits in Faslane, Scotland; Souda Bay, Crete; and Toulon, France. New Mexico's commanding officer Cmdr. Daniel Reiss joined the Navy through the NROTC at Rensselaer Polytechnic Institute in 1998. He graduated with a bachelor of science in chemical engineering and then attended the nuclear training pipeline and Submarine Officer Basic School. He holds a master of arts in national security and strategic studies from the U.S. Naval War College and is a graduate of the U.K. Submarine Command Course "Perisher." Reiss assumed command of New Mexico Jan. 18, 2016. Kittery, Maine, will serve as host community for New Mexico's crew while they are in port. On Monday, 27 February 2017, the USS Albuquerque was decommissioned after over thirty-four years of proud service. The boat's history and other details are given in the decommissioning program. For three decades, Albuquerqueans have been anticipating USS Albuquerque cruising up the Rio Grande for a port call in her namesake city. According to legend, the lucky skipper would have received the keys to a Rolls Royce. As it turns out, the feat had already been accomplished in 1943, well, sort of. Step back in time to December 7, 1941. At 0330, on a moonlit sea, about 10 miles off the coast of Oahu, Ensign Kazuo Sakamaki and Petty Officer Kiyoshi Inagaki climbed through HA-19's 15-inch conning tower hatch. The boat detached from the aft deck of its mother ship (Submarine I-24) and slipped beneath the surface. Sakamaki's orders called for HA-19 to arrive at the entrance of Pearl Harbor by 0800 but, unable to navigate into the dredged channel due to an inoperative gyrocompass, it went aground on coral reefs multiple times and never was able to join the surprise attack. Scuttling efforts failed, Inagaki drowned and Sakamaki became the first Japanese prisoner of war when HA-19 drifted around to the southeast coast of Oahu and became beached at Waimanalo, about 10 miles south of Kaneohe. The two-man submarine was salvaged, shipped to the mainland and became the star attraction in wartime parades from coast to coast. On January 14, 1943, HA-19 visited Albuquerque. The captured submarine was featured in a parade along Central Avenue as part of a cross-county tour to sell war bonds. This image shows the submarine westbound between 2nd and 3rd Streets with the Grand Central Hotel as a backdrop. Photo (PA1982.118-19) courtesy of Albuquerque Museum. On the day of the visit, the Albuquerque Journal ran a full-page advertisement, featuring three US Navy photos of HA-19, for the War Bond Parade. 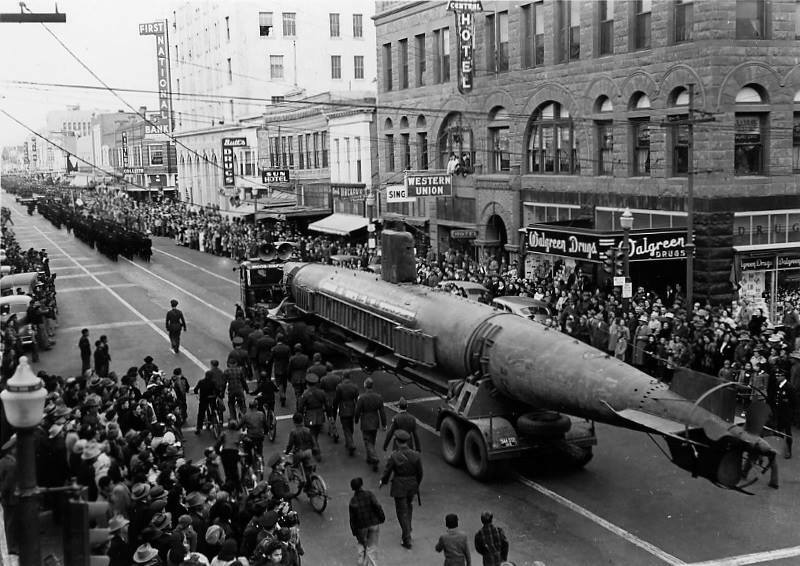 By mid-morning, 20,000 public-spirited Albuquerqueans lined Central Avenue to see the sub on a 90-foot truck-trailer rig. Therefore, HA-19 really became the first submarine to visit Albuquerque. The story of Japanese suicide submarine operations is quite intriguing. 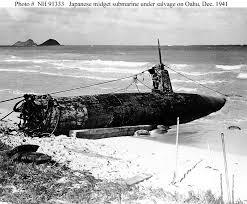 HA-19 was one of five midget submarines deployed during the attack on Pearl Harbor. The 47-ton, 78-foot submarine was powered by a single 600-hp electric motor and two counter-rotating concentric propellers. She was armed with two 800-pound muzzle-loaded torpedoes in vertically stacked bow tubes. Her attack orders specified carriers, battleships and cruisers as targets during the lull between two air strikes, followed by scuttling with a 300-pound charge. At 0817, USS Helm (DD-388) raced out of Pearl Harbor towards the open sea. A lookout spotted HA-19 stranded on a reef. Helm shot and missed but the blast jarred the submarine free. After submerging, she ran aground again, this time damaging the firing mechanism for one of her torpedoes. Sakamaki observed black smoke billowing over Pearl Harbor until depth charges disabled his periscope and his second torpedo. The crew was overcome by battery fumes and the submarine drifted with the currents. They awoke at night off Waimanalo. Inagaki abandoned ship (and drowned in the pounding surf) as Sakamaki set the scuttling charge. It failed to detonate as he swam ashore and collapsed on the beach. HA-19 floundered in the waves. Sakamaki was captured the next day when awakened by an American soldier pointing a pistol at him. HA-19 on Waimanalo Beach, Hawaii. US Navy photo. HA-19 being hauled ashore. US Navy photo. Sakamaki asked that he be killed or allowed to commit suicide. Neither request was honored. Admiral Isoroku Yamamoto, Commander of the Japanese Combined Fleet, was outraged that the disgraced submariner allowed himself to be captured alive. 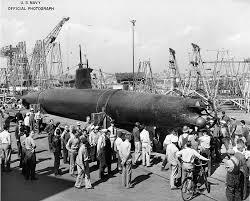 The salvaged submarine arrived at Mare Island Naval Ship Yard at Vallejo, California in January 1942. Yard workers marveled at the protruding torpedoes and net cutter. US Navy photo. The war prize launched its circuitous nationwide war bond tour, sponsored by the US Treasury Department, in San Francisco in October 1942, passed through New Mexico three months later, visited many cities, including El Paso, San Antonio and Washington, DC, and was in Chicago when the war finally ended. It was perhaps the first overland submarine cruise in history. In New Mexico, the submarine toured Lordsburg and Deming, then turned north, following the Rio Grande to Las Cruces and Socorro before arriving in the Duke City. Before leaving the state, it also toured Roswell, Artesia and Carlsbad. In the Las Cruces area, where the parade included high school bands and a contingent from New Mexico A&M's ROTC unit, 4,000 citizens bought $100,000 in war bonds. In Albuquerque, the captured submarine inspired local residents and visitors from nearby towns to invest $175,000 in war bonds and stamps. The military-civilian parade was the biggest ever staged in Albuquerque. It was headed by Col. F.D. Hackett, Commander of Kirtland Field; Col. John Fite in command of the Mobile Air Training Depot; and Clyde Tingley, City Commission Chairman. Spectators jammed the sidewalks as the pageant moved along from Broadway to 8th Street. Besides hundreds of soldiers from both military establishments, the parade included UNM's NROTC unit, the 31st Army Air Force Band, the American Women's Voluntary Service, the Women's Army Auxiliary Corps, the American Legion Drum and Bugle Corps, and veterans of World War I. When it ended, the boat was moored on Central between 4th and 5th Streets and went on display for the next 12 hours. The crowd immediately surrounded the boat, pushing and shoving to be the first to buy war bonds and stamps - the price of a look through small glass windows cut into the port and starboard sides of the hull to view two Japanese dummies in cramped quarters. After the initial stampede, spectators, facilitated by fold-down steps and catwalks, formed an orderly steady stream. In January 1947, HA-19 went on display at Naval Station Key West. 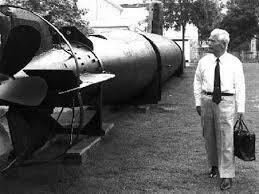 In 1991, the submarine became a permanent exhibit at the National Museum of the Pacific War in Fredericksburg, Texas. That same year, Sakamaki was reunited with his old submarine. Sad thoughts of his lost shipmate, the faulty gyrocompass, his failed mission and the demise of the other four submarines must have weighed heavy on his mind. Kazuo Sakamaki walks around the two-man submarine that he piloted. Photo courtesy of Historic Naval Ships Association. 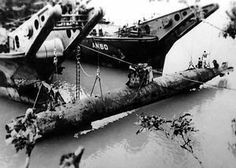 Only one of the five submarines managed to sneak into Pearl Harbor and may have torpedoed USS Oklahoma (BB-37), causing her to capsize. All but HA-19 and Sakamaki perished in the attack. Eight years after his emotional reunion with his old boat, he passed away. Imagine the excitement of seeing a captured Japanese submarine cruising down Central Avenue. World War II was still raging and Americans needed something to cheer about. The Albuquerque War Bond Parade was just the venue to raise spirits and funds to avenge Pearl Harbor. Perhaps this first encounter with a naval submarine foretold of New Mexico's future involvement with namesake submarines and their proud undersea warriors.